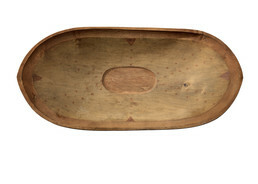 This shallow wooden dish may have been used for serving fish or strips of meat. Athabascan men carved bowls from spruce roots, choosing a large section from near the trunk of the tree. They hollowed the root section out with fire and then shaped it with a beaver tooth chisel; marks left by the tool can still be seen on this bowl. The geometric patterns were painted with red ocher.